The Xiaomi Poco F1 Armoured edition is available in India at a price of Rs 28,999. We are comparing the smartphone with the OnePlus 6T to see which one is better when it comes to hardware? The Xiaomi Poco F1 has been called the “Best rated flagship” device by Xiaomi. The company has launched the new “Armoured” edition of the phone, which features a “real kevlar black” panel that is different from what we have seen in the Poco F1 regular edition that comes with a Matte black plastic finish at the back. Not just the design, the Poco F1 Armoured edition comes with an 8GB RAM and 256GB internal memory in compared to the Poco F1 that features a 6GB RAM and 64GB internal memory. On the other hand, we have the flagship killer OnePlus 6T that has been launched in India a few months back with an in-display fingerprint sensor and a Qualcomm Snapdragon 845 processor. So, let’s do a quick specs comparison of the two to see the difference? 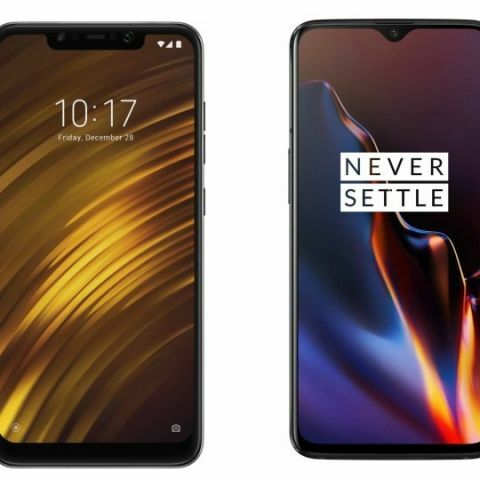 The Xiaomi Poco F1 sports a 6.18-inch display that offers a resolution of 1080 x 2246 pixels, while the OnePlus 6T features a slightly bigger 6.4-inch display that comes with a resolution of 1080 x 2340 pixels. The phone has a water-drop notch on top of it, which houses the front-facing camera. When it comes to the performance, both the devices are powered by the latest Qualcomm Snapdragon 845 processor. The OnePlus 6T offers 6GB RAM and 128GB internal memory, which is expandable to up to 256GB. On the other hand, the Xiaomi Poco F1 Armoured edition packs 8GB RAM and 256GB internal memory. As far as the cameras are concerned, the Xiaomi Poco F1 Armoured edition has a dual 12MP + 5MP rear cameras along with a 20MP unit on the front. The OnePlus 6T has a dual 16MP + 20MP camera set up at the back with a 16MP front-facing camera. 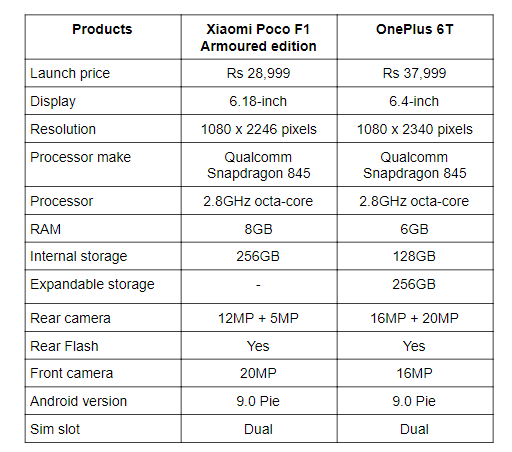 The OnePlus 6T is available in India at Rs 37,999, while you can get the Xiaomo’s Poco Armoured edition for Rs 28,999.
why xiaomi mi3 is so cheap with such specs?